I've been trying this and also have seen many swimmers. They can just easily lie down on the water surface and their body starts floating without any hand and leg movement. I try to keep my body as straight and loose as I can, but eventually my legs start sinking and after 2-3 seconds they touch the bottom of the pool. How can I float better so that I can improve my backstroke? See this pic for reference - how simply he is able to get his body floating on the water surface. Initially for 2-3 seconds my body floats like him but after that my lower body starts sinking. One important factor not mentioned above is core strength. Most of your buoyancy comes from air in your lungs which are obviously in the top half of your body. By using core strength in your abs it's possible to maintain a flat body position even with low natural buoyancy. I am quite a muscular guy and have been swimming from a very young age, and I can float on my back simply by holding air in my lungs (not breathing out fully but still breathing) and using core strength to lay flat and keep my feet on the surface. If you want to improve this I would suggest doing some core work like leg raises, crunches etc at the gym. Floating, and getting control of floating isn't very hard, but it can take a lot of practice. If you don't have much body fat, you're already predisposed to sink, but managing your position well, and your breathing will help you overcome low body fat. If you already have high or normal body fat, learning how to control your position will allow you to float even better. Relax. This is the most important, if your panicking and flailing, you'll sink. Balance. Learn how to position your body so your weight is balanced (or your leverage is balanced). this includes pushing down with your shoulders to compensate for your heavier torso). Practice. Whenever you are in the pool, spend some time trying to float. If you can find a partner, have them help you by adjusting your position while you are attempting to float. This will aid you in teaching your body how to position itself. As far as breathing goes, breath deeply, this will fill your lungs. The better your lung capacity, the lower your overall body density will be and you will float better. 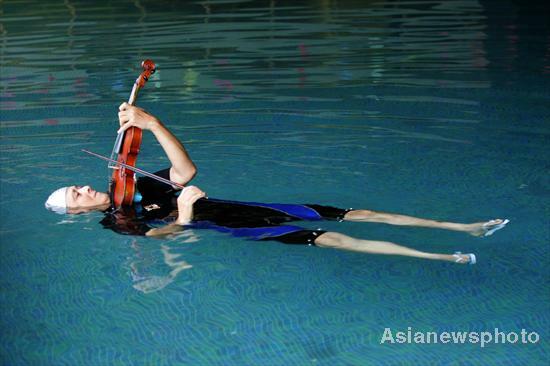 As far as being able to so something like float and play the violin, my guess is that this particular swimmer has a bit of help from her suit. It looks to me like there is a bit of air trapped in the legs. However, there is a great deal of practice involved even still. Wanted to address one more thing. If you're actually doing the backstroke (or back crawl), in the style of competitive swimming, then you shouldn't have much trouble floating (this isn't really floating per-se, it's swimming, which is different then simply being buoyant). This is because your motion should be a big part of what is keeping you on the surface, your kick should create plenty of upward motion and should keep you on top of the water. Make sure you keep your chin up (look straight up or behind you slightly instead of at your body) and your stomach up (try practicing this by putting a noodle under your back so you can feel where your body needs to be) and your arms and legs out like a starfish (little corny, but easy to remember). You may need to bend your knees like in this picture. If the above doesn't work by itself (I know a few people who have body types that just don't allow them to float without doing the following), you may need to scull with your hands. Good instructions on how to do this are here. For floating on the water you make practice, (firstly practices to float on water with the movement of leg not using hand, later using hand and not leg) and after practice stop both leg and hand movement so you can easily floated.